This huge smile from Priscilla tells it all. 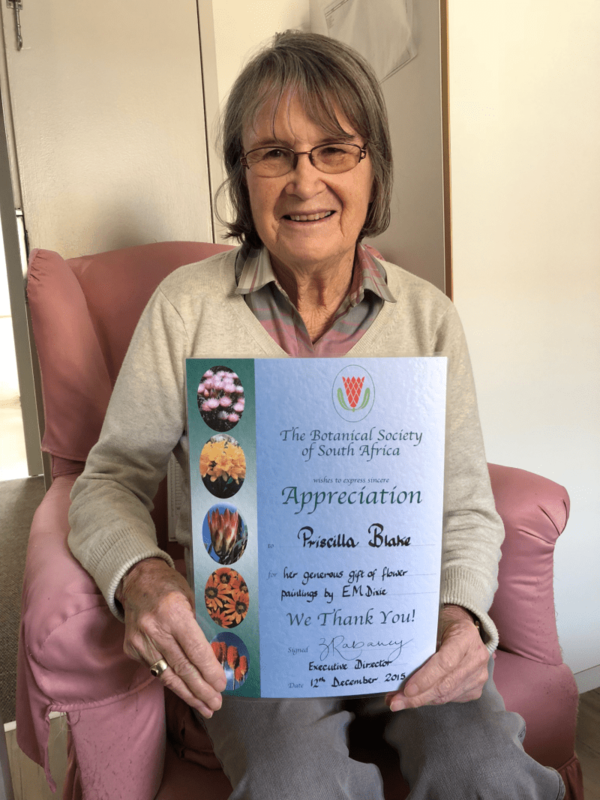 At long last Priscilla has a small but tangible token of her very substantial gift of Ethel Dixie paintings to Kogelberg Branch. A visit to her new home, a small room in Heritage Manor’s Health Care Centre, found her happy and alert, in fact she was reading Gerald McCann’s Seven Years among the Giants, the giants being Protea cynaroides. (McCann was a forester in the Kogelberg.) It was a signed copy as was her Your Place in the Kogelberg by Tim Attwell. Priscilla confirmed that her link with Ethel May Dixie was her grandmother’s former companion, Dolly Ransome. The sixteen Ethel May Dixie flower paintings from Priscilla came to us in very good condition; John Rourke ascribed that to the dry air of Johannesburg. He did, however, arrange to have them mounted on acid-free board and reframed by Mission House Gallery of Onrus. Kogelberg Branch footed the modest bill. The paintings will be on display in Nivenia Hall on Saturday, 17 November, at the talk on Botanical Art by our own top botanical artist, Vicki Thomas. Sadly, Priscilla will not be there, but I think she does know that we very much appreciate her gift. Do diarise this date, it will be a very special Kogelberg Branch occasion.